Water damage is a complex, temperamental creature that rests in an arena of paradox: water is life to all living things, yet it brings death and destruction under the right conditions. Water is “beyond good and evil” and in circumstances where there is a total lack of it, (or in dire times when there is simply too much) mankind has declared that “god is dead” and has perished under the canopy of his own questionable existence. When crew members from the best water damage Miami company read the writings of Friedrich Nietzsche, this tragic duality of the human consciousness unfolds and reveals its sustenance in storm damage and pipe bursts. Friedrich Nietzsche—German philosopher, cultural critic, poet and composer; only the clairvoyance of a soul who was elevated to a perfect state of consciousness through embracing his own existential essence with tragic arms could dare comprehend and descry the nihilism that reveals its horrific beauty in the metaphoric ballet known as water damage. Then the “twilight of the idols” takes its place on this puppet theatre production we call life, and water damage restoration services remediate that which was dealt by fate…by the gods. Behold, I teach you the overman! The overman is the meaning of the earth. Let your will say: the overman shall be the meaning of the earth! I beseech you, my brothers, remain faithful to the earth, and do not believe those who speak to you of otherworldly hopes! Poison-mixers are they, whether they know it or not. Despisers of life are they, decaying and poisoned themselves, of whom the earth is weary: so let them go! Ignore the red flags and flare gun blasts foretelling toilet overflows, pipe bursts, roof leaks and all the ghastly horrors ruptured hoses have to offer; the genesis of mold has already begun spinning its web of diabolical misery and woe. Deny it as you deny the maker and take on the third eye of the overman, and you may be dealing with water damage at its most complex, chaotic state. 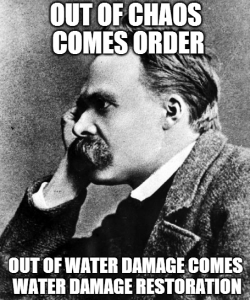 But relax, for Nietzsche teaches that out of chaos comes order, and out of water damage comes water damage restoration. Then all is right in the world. The overman sleeps in the bosom of the idols where everything remains as nothing, and nothing binds us to our fate to wander aimlessly as a modern-day prophetic Sisyphus clawing at the dirt to emerge from a burial surrounded by the brick and mortar that water damage disintegrated. Here ends the lesson.